Have you seen the National Trust list, 50 things to do before you’re 11 3/4s? It’s so good! I am far too excited about this for a 30 something year old! Last year we dipped into the list, by accident really, and ticked off some of the activities. This year we’ve decided that we’re going to try as many of the activities as we can. The munchkin loves the idea, I’m not sure if it’s because she’ll get to try new things, like riding a horse, or if it’s because she’ll get to do things we’re normally reluctant to let her do, like climb a big tree. I love the idea because it really is getting back to all things good about being a kid. Being outside, adventure and fun. Luckily for us mums and dads most of the activities are free! Always a bonus. I’ve downloaded the app, which is, bloody brilliant by the way, so I have the list handy and now we’re all set. Last weekend the munchkin chalked off her 1st activity. The froglet was a bit off colour so we were stuck indoors, which was a shame as the weather was really nice. So she didn’t go completely stir crazy we decided to have a look through the list to see what we could do in the garden. We needed something that wouldn’t take a lot of planning and found the perfect one. Making Mud Pies! 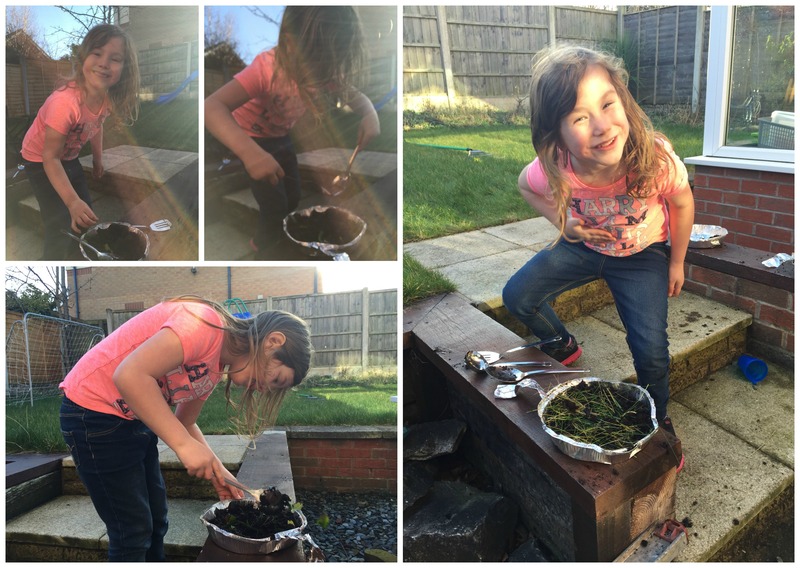 All you need for a mud pie is some mud, some twigs, leaves or grass for decoration and something to mix with, hands of course are fine mixing tools. The munckin was in her element! This was such a simple activity which brought so much fun, like most of the other activities on the list! 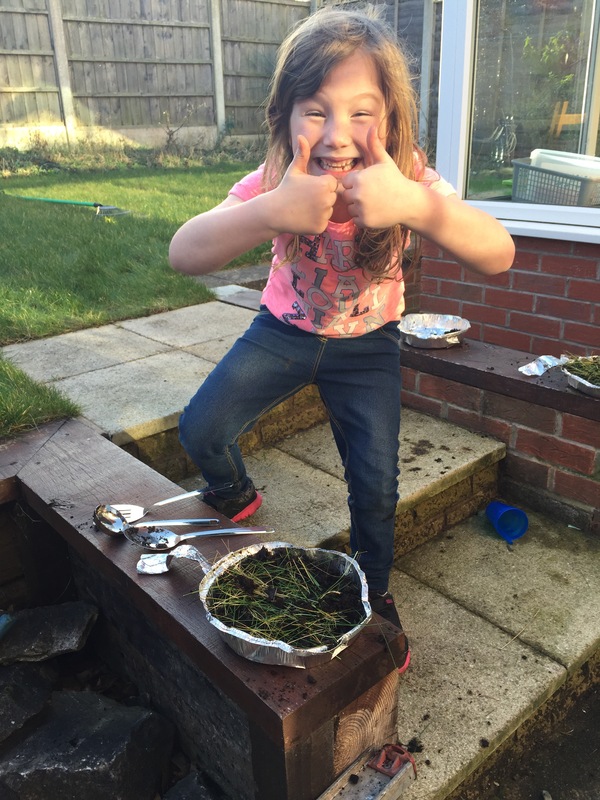 She was out in the garden for ages mixing the mud with water and adding other ingredients and toppings to her pie! I think a couple of worms ended up in there too. She was very pleased with the end product and insisted we all go outside to ‘try’ the pies, of course they were really tasty! So we’re off and we’ve made a start , one down only 49 activities to go! We can’t wait to try out some more! I’ll be sharing the activities as we get to do them so you can join in the fun with us, well virtually anyway!